With only five weeks to go until the big day, we are well and truly in the Christmas spirit here at Slattery. We have made the decision to take a break from the Manchester Christmas markets this year. This has enabled us to spend time creating new products for our shop and expand our e-commerce, allowing us to deliver more goods around the country. 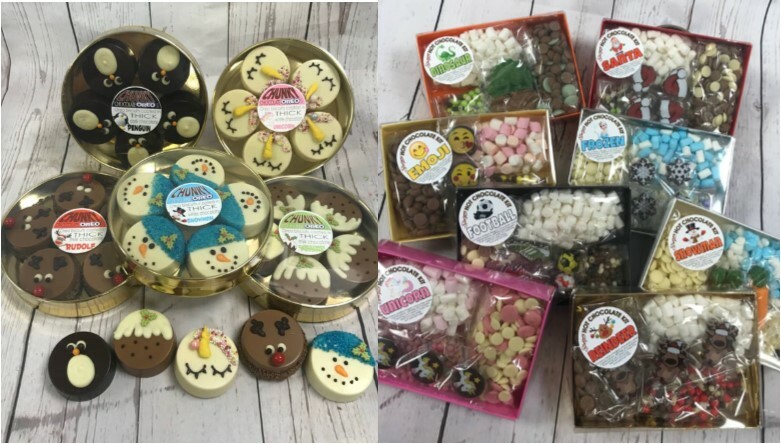 Many of our new Christmas products are now available to view and purchase online, with plenty more in our shop. Our themed hot chocolate packs have become a favourite already, with our boozy versions to ensure the adults get a treat too! To help you beat the Christmas rush, we have some amazing Black Friday deals taking place on Friday 2th November. The unmissable deals start from midnight online and our shop hours on this day are 8am-7pm. Our offers include 99p delivery on all online orders, wit orders over £25 being entered into a prize draw to win back the value of the order in gift vouchers. In the shop we will have special offers on our hampers and Christmas chocolate; don't miss out! The Mason's Dining room welcomes the Christmas menu on Friday 1st December. During the festive period, there will be a Christmas Afternoon Tea on offer as opposed to our usual Lancashire Afternoon Tea. December is an extremely busy period in the fining room and booking in advance is recommended. On Saturday 23rd December, Bessie's Boys Brass Band will be playing in the dining room and shop to provide customers with festive music on our final day of opening before Christmas. For many years, we have supported the charity MedEquip4Kids with a Chocolate Extravaganza evening taking place this year on Wednesday 6th December from 7:30pm. We are proud to host such a successful evening every year with approximately 300 people attending. On arrival, guests receive a glass of mulled wine or spiced apple. They can then go on to take part in all our activities, making cupcakes and biscuits in the cake room, decorating chocolate lollies and trying some tasty truffles in the chocolate room. Fresh loaves to take home are also available from our bakery. Our dining room is open all evening for guests to have a hot mince pie with a tea or coffee, which is included in the ticket price. There are many prizes on offer throughout the evening and members of MedEquip with also be selling raffle tickets on the night. Tickets are £15 and there are a few remaining available to purchase from our shop. The week beginning 18th December, we have extended opening hours in our shop. From Monday 18th-Friday 22nd we will be opening from 8am-7pm, giving our customers extra time to purchase their Christmas goods. Our final opening day before Christmas is Saturday 23rd December. We are open 9am-5pm that day, and will then close for our Christmas holidays and reopen on Tuesday 2nd January at 9am. We hope you enjoy all our new products that the team have been working on and wish you all the best for the festive season!